When I was a kid thought of upside down cakes as “dump cakes.” You know, you dump the cake out of the pan and stuff runs everywhere. It seemed reasonable at the time, even if it sounded less than palatable to the average ear. My boys think upside down cakes are magic, and I had an audience when I turned this one out onto the serving plate. Top Gun stood as patiently as he possibly could, his eyes big as saucers when I lifted off the pan, and he simply said, “Wow.” Then after tasting a few crumbs he wanted to know when we were having dessert. I like upside down cakes because the fruit and glaze looks so pretty on the top, and for the most part they are easy to make. You can serve them as is or dress it up for guests with a little whipped cream or ice cream; either way, you have a simple cake that looks beautiful and works well for dessert or brunch. 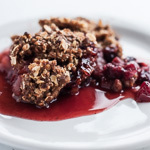 With cranberries in season, this is an easy and tasty way to use them. 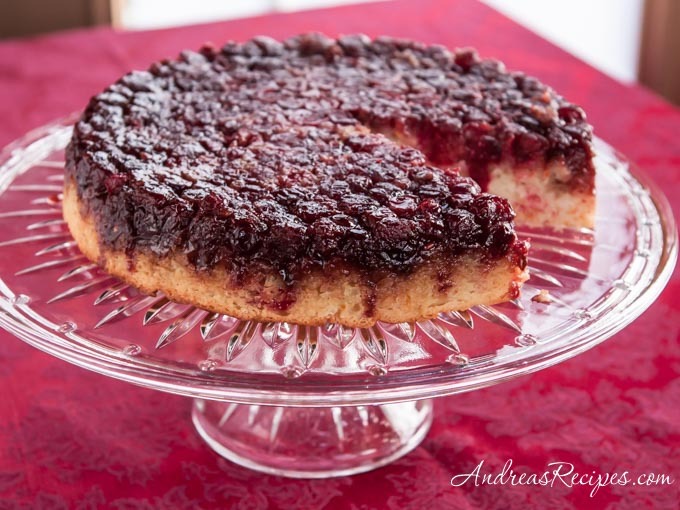 The tartness of the berries and the orange juice balances the sweetness of the brown sugar, the orange zest carries on the theme in the cake, and the whipped cream has just a touch of orange flavor with Grand Marnier. The fruit and glaze is easily made on the stove top in the cake pan, an added bonus because you don’t have to dirty another pan, and you can use a standard aluminum cake pan or an oven-proof skillet, such as cast iron. If you decide to use a cake pan, make sure it isn’t coated with paint because those paints often are not designed to take direct heat from a stove or cooktop. Very beautiful and delicious looking! 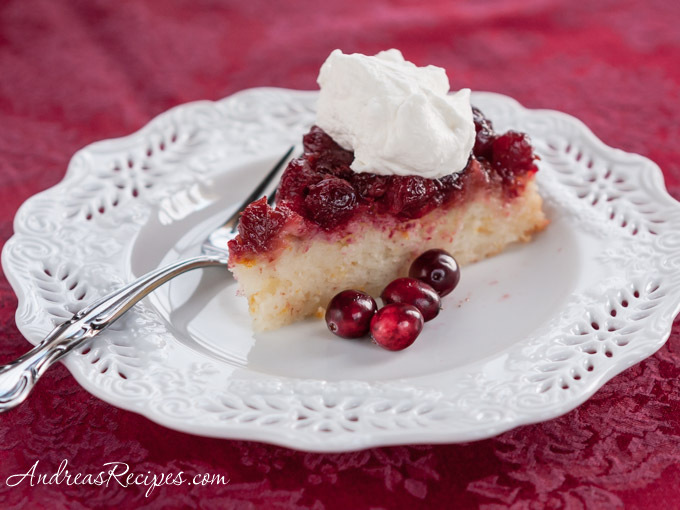 I have some fresh cranberries at home, so I might make an Upside-Down Cake with them… Thanks for the idea! This looks absolutely delectable and tempting…. Wow this picture looks great, the lighting is perfect. The whipped cream is an interesting twist! Upside-down cakes never to fail to impress. 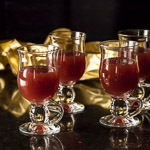 I love experimenting with different fruits too, and cranberries and orange are ideal for the holiday season. a while back i made a cranberry upside-downer from DG’s Baking from my home to yours. It was great. However I really like the addition of orange here! Looks absolutely delicious! I’ve made – and blogged about – cranberry upside down cake à la Nigella Lawson – which was delicious, too. I’ll definitely try to make one again this christmas! I used to think “dump and run” cake but I’m a recent convert and I sure want to try this one. Orange and cranberries are among my favourite flavours! Love it! Thanks everyone! It seems like upside down cakes are quite popular this year. I think cranberry is a flavor that I’ve come to be extremely fond of in the last 10 years. This is really a work of art Andrea! 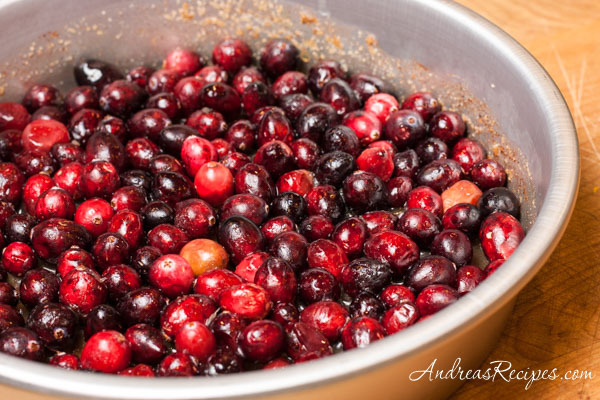 Orange and cranberries-great flavor combos! Your upside down cake looks wonderful.